What if learning was a byproduct of having fun? I fundamentally believe that we engage our learners by designing experiences, not just assigning lessons. One of the best ways to make our lesson plans and daily activities more engaging is to add game-like elements to our classroom experiences. What’s the point of your activity? Why should your students want to experience it? The first place to start is not necessarily your curriculum, but by identifying what is limiting learning in your class. For example, you may have limited devices in your class so you decide to create a station rotation, where students must complete an exercise before moving to the research station that has computers. After constructing something, they can then move on to the record station that has the students using webcams. Because the students are rotating, all of the devices are not being used at the same time. Because you made a game out of it by setting up challenges, kids are having fun. Win, win! Welcome to the world of gamification. You just improved student learning by taking something that wasn’t fun (not having or using devices) to making it fun (competing to get a chance to use tech). The following are my five recommendations for any educator looking to level-up their lessons by gamifying the learning experience. Keep it simple. When developing your activity, you will find that the most simple and easy-to-follow instructions are the best way to keep your students engaged and “playing along,” so to speak. Nothing frustrates students more than overly-complicated instructions. Make your steps really clear by explaining the purpose and gameplay. In my Smashboard Edu activity, I learned (after a lot of feedback) that the gameplay needed to be simplified. 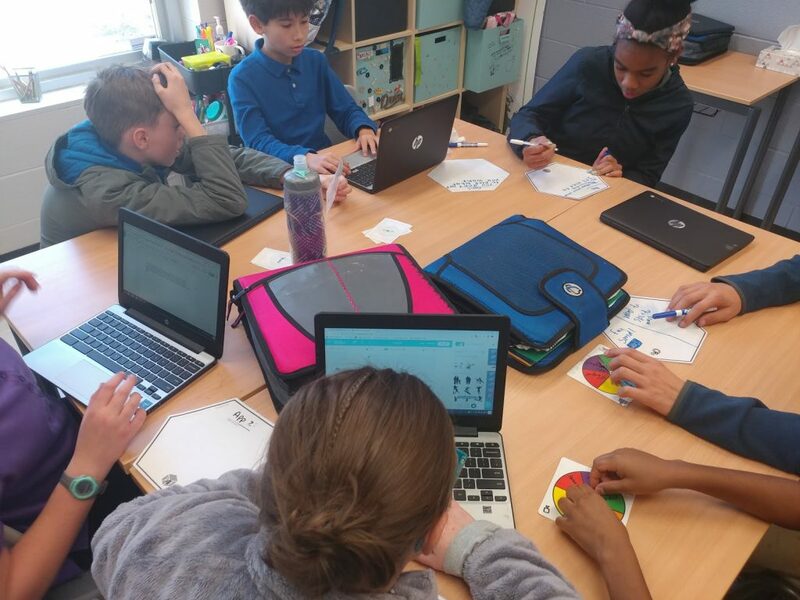 It evolved from a digital app-smashing Hyperdoc, to a physical board game with cards and dice, to just a simple set of cards. The gameplay is simple: pick a problem to Smash, research the problem, solve the problem and share your solution. Then, reflect on the process. Yes, there are plenty of advanced play possibilities, addons, and mods, but starting out simple is the best way to get buy in. To make it interesting, split the class into groups of three to four and have them collectively complete the game together. Make it Playful. Intend for your activity to be played. What makes an activity more like a game, you might ask? It is the addition of game elements. First of all, sterile language is removed. It is not a protocol or a procedure, or even just an activity. Bell-ringers and worksheets are completed. Games are played! Two of my most popular games are called “Smashboard Edu” and “Maker Kitchen.” In Smashboard Edu, we problem smash. Kids get it every time. Another thing I like to do to make things more game-like is add musical timers to control the pace and manipulate the mood. If I want participants to think fast, I add fast paced music with a countdown timer. If I want them to contemplate their answers but remind them that they have limited time, they may get a tick-tock sound, or classic Jeopardy timer. If they have extended time, but I want to remind them that the stakes are high, I may play an epic movie soundtrack in the background. Game shows do it all the time. It works. It’s fun. Use materials. If you choose to use paper and pencil, try golf pencils and post-its instead of lined paper. Put each step of a process on a gameboard or use cards. Use less words, add more symbols and color. In the development of games, I have used dice, spinners, Monopoly and Candyland-like boards. Lately I have been creating cards to design all sorts of activities. Sure, a Google Doc would do, but cards invoke play. We hold them, we sort them, we flip them over, we yell out loud when we get down to our last one. Just by handing out cards instead of distributing a worksheet, we expect joy to be a part of this process. If your game is not is not fun, it’s “dumb” and no one is ever playing again. Game over. Another game-like element you can add to any collaborative activity are SOS cards. Whether we’re playing with Smashboard Edu or another set of games that I created related to “Maker Kitchen,” I always hand out one, “get out of jail” card to each group. Groups are reminded that they can always ask someone else, refer to other sources, or search online. Nevertheless, if they still need the help of the instructor, they can use their SOS card one time. It’s amazing how few students actually use this card because they compete to keep it! Trial play. Your game or activity doesn’t have to be perfect before putting it before students. Not sure if your game is any fun? Ask for feedback from your kids. Tell them you are making a game, have them play the game, then ask them for feedback on how to make it better for your next class. If you teach middle school math, you may start with the skeleton of a game in the beginning of the day, and have a full-fledged completed game to utilize by the end of the day! Make it rewarding. Notice, the final goal is to make it rewarding, not necessarily give out rewards. Prizes are fine and all, but when used too frequently, we’re training our students to hold out their hand every time they do a good job. Creating a trophy or putting names on a plaque is a great way to publicly applaud a team for their good work. But notice, that type of reward is not a consumable, like a party, or extra recess, or for goodness sake, candy! I get it, candy is a cheap reward that students love and many teachers can afford. Once kids outgrow stickers our jump shouldn’t be to candy or pizza, it should be from extrinsic to intrinsic. Not only does candy rot their teeth and their attitude, for many kids with already poor diets we are exasperating a much bigger health problem that affects their behavior and mood. Build intrinsic rewards for completing your activity, and provide healthy snacks if you want to give your students a treat. Keep them seperate. Have your students create their own games. When it comes to any classroom activity, I have a bias towards creation over consumption. Don’t just read a book, write one. Don’t just read a speech, deliver one. Don’t just play games, create them! Furthermore, trying to gamify all of your lessons is hard work and time-consuming. Try delegating that task to the students. Split your students into small groups, give them the vocabulary list or your multiple choice test and a set of game materials and tell them that their task is to create a fun game out of the curriculum content. Set your musical timers and go! I wonder if you’d share a little more about Smashboard Edu. I’d like to know how it’s played.